Being physically active increases the amount of norepinephrine, a substance that can help our body and brain deal with stress more effectively. 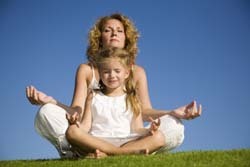 Physical activity also helps loosen up muscles and prevent strains, stiff neck and other things that may cause stress. Exercising also helps release endorphins or happy hormones. For some people, caffeine may be a part of their daily routine. However, caffeine also makes you hyped up and can make you feel quite uptight. People who drink too much caffeine are more anxious than those who don’t. Opt for teas and other non-caffeinated beverages instead. Some herbs can be used to make tea that will help you deal with stress more efficiently. Studies and research show that herbs like Asian ginseng, Siberian ginseng (eleuthero), American ginseng and lots more can help stabilize blood pressure and sugar levels during stress. This can help your body cope up with stress way better. A good massage can help loosen up your whole body and can take your mind off things that cause stress. It will help your body relax and be able to cope with stress better in the future. You can also make use of candles and aromatherapy oils which have calming effects. No one likes waking up with a stiff neck. It is not only annoying but it can also be quite painful. People with stiff necks are often uncomfortable in doing their daily activities as their actions and moves somehow seem limited. What’s even worse is that there is no particular medicine that you can take in to remedy for stiff neck. You might resort to acupuncture, massage and warm baths but nothing more. That is why it is very important to prevent getting a stiff neck in the first place. Usually the cause of stiff neck are related totype of pillow, mattress and sleeping position. So here are a few things that you should look into before going to sleep. Your mattress should be firm and must provide good support to your back. Pillows and mattresses should work such that your neck and back are in line – preventing stiff neck and back aches when you wake up. If possible, avoid sleeping on your stomach. Sleeping on your stomach will cause you to turn your head to one particular side more often. Maintaining such position will most definitely cause a stiff neck by the time you wake up. If you meet these three steps, I am sure you would not have stiff neck when you wake up the next morning. The video below can also help you relieve stiff neck. Make sure you check it out. To get more articles, please visit my main blog site.